While Virtual Reality (VR) only offers a key to a new world, Augmented Reality (AR) “expands” the world we live in. Thereby, the technology provides helpful context information or adds features to an existing application. But why is there currently such a hype surrounding AR applications? And are there already any existing use cases of AR with serious commercial value? Augmented Reality (AR) is about expanding the real world through contextual or non-contextual information. Although this information is virtual, it is perceived to be real by the user. AR, in general, requires a combination of hardware and software tools to connect the different levels. The real world is usually represented by a camera. More precise, its main task is showing the user the real world through eyes which can – in contrast to human eyes – also perceive digital information. An acceleration sensor, a gyroscope (a circular instrument that accurately determines the orientation of the smartphone) and a depth detection function ensure that the user can move in a reality with expanded elements and digital information. If you exclude reality from the equation, you obtain Virtual Reality (VR). AR is not new, but it is definitely ready. The idea behind AR is neither new nor ultramodern. Personally, I remember the first time I used an AR application in 2009 when I euphorically installed the App AR-Maps on my iPhone 3G. Already the second generation iPhone featured GPS and a digital compass allowing this function. Although the app is no longer existent, AR-Maps had a smart concept even given today’s standards: The user only had to point his iPhone to the horizon and could see Google Maps locations on his camera. In the spirit of MVP, the solution was flawed and fragile, but indisputably innovative. 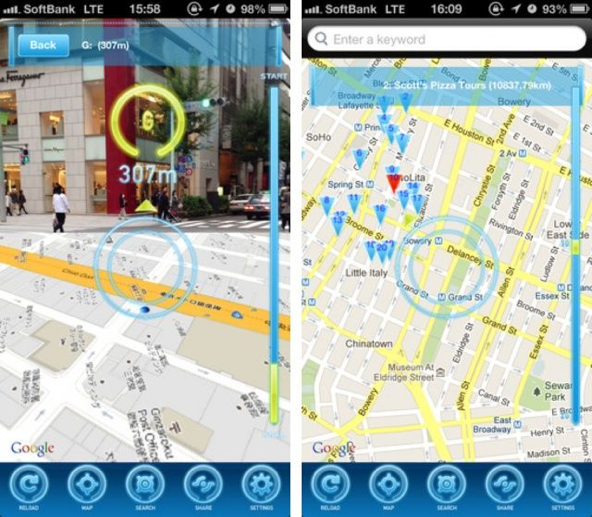 Despite improving functionality over time (iPhone 4 included a gyroscope that slightly enhanced stability), AR-Maps proved to be a concept without use case in the real world. After the initial amazement, the app disappeared from the users’ iPhones. At the moment, the use of AR is still rather complicated. Often, you find yourself in an situation unsuitable for this technology due to unfavourable lighting conditions or incompatible wall or floor colours. Everything that looks comparatively easy at conferences and keynotes is, in reality, a challenge. After all, the stages are set up under special conditions, the lighting is optimized and the presentations are properly rehearsed. However, it is worth giving AR a chance for the mass market. One reason is that one third of the world’s population already uses the technology behind it every day in smartphones. The hardware and software manufacturers have also recognized the importance and have been setting solid foundations for enabling AR in 2017. With iOS 11, Apple released an ARKit, and provided developers with dedicated software development kits (SDKs) to support the development of AR applications for iPhones and iPads. The cameras of the latest iPhone generation (iPhone 8, iPhone 8 Plus and iPhone X) have been recalibrated specifically to optimize conditions for AR. Just months later, Google followed with ARCore, a free platform for Android systems that provides a SDK for AR, similar to ARKit, for compatible devices. On the hardware side, Microsoft has taken a lead with very modern HoloLens headsets priced at 3,000 US dollars. Given the fact that the product is too expensive for the mass market, HoloLens headsets, nowadays, offer interesting applications for location-independent engineering work. The streamlined product is expected to be delivered in 2019. From a business perspective, it arises the question of why to start using AR right now? Firstly, from a marketing point of view alone, it is always advantageous to pick up current gimmicks and to have up-to-date technology. Secondly, AR application development has never been easier and cheaper than with toolkits like ARCore and ARKit. Solutions like ThingWorx even solve most coding issues and enable the creation of AR experiences with very little programming skills. And thirdly, the hardware has finally also caught up far enough to offer the user an actual experience with AR. When Wingnut AR presented its first AR game at the Apple developer conference last year, even AR experts and geeks were amazed. The game has been developed with the ARKit announced by Apple. 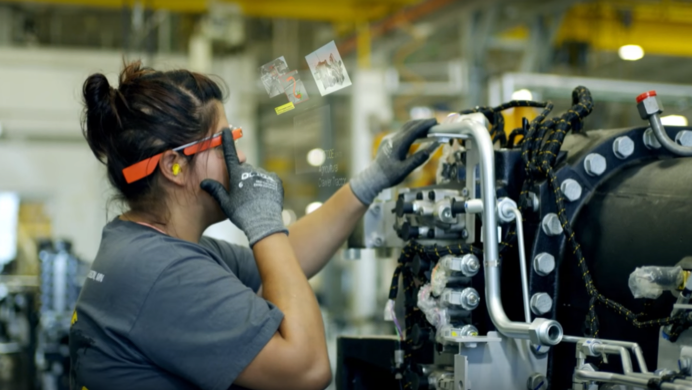 One of the clearest signs that time has come for AR is the new Google Glass program from Google’s parent company Alphabet. Some years ago considered to be one of the greatest flops in the company history, it has now been put back on the market – like a phoenix from the ashes – as an industrial solution for safety eyewear and has established itself in the market in recent months. Technology is ready, the programming know-how is available – it is only a matter of finding the right real life applications for AR through a creative process. The time has come for Augmented Reality, and it has never been easier to get started with this topic.